This incredibly striking 5 1/2" bear is called Monarch. He is made of very short ivory Schulte mohair combined for his arms, legs and the tops of his ears with deep dark brown mohair of the same length. 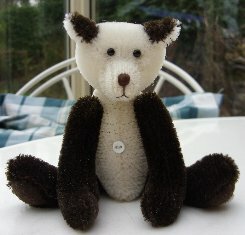 In style, Monarch is the same as the larger bear Stotty shown here on the website shop, but as you can see, different fur makes a very different bear. His pads and paws are deep brown ultrasuede, he has a dark brown stitched nose and shiny black German glass eyes. He has long arms and short legs with round footpads, both arms and legs are weighted with steel shot. His body is filled with steel balls and this weight makes him sit nicely with his paws between his feet. We thought he had a regal appearance so Monarch, which is a variety of Apple, seemed a good name. I do hope that you like him, he costs £47 plus postage. Please note that as with all our bears, Monarch is not a toy and is not suitable for children. Sorry - Monarch has been adopted.